You have all heard of National events such as Movember UK and Dry January. 2015 was the first year we decided to launch ‘DAWGUST”, during which we raised funds to rescue and transport galgos from Spain. We raised an amazing £7,000 for this cause, and we still have a “pot of money” to continue bringing galgos to the UK two at a time, (we currently have Figgy and Luna who are waiting for their forever homes). There were some very memorable events last year to raise money, which were brilliant fun – “The Malibu Challenge”!! – WOW Kim raised so much sponsorship drinking every night (did I really sponsor this!! ), David, Debi, Megan and Kim did an on-line charity auction which raised an amazing about of money, Colin organised a quiz evening, just to mention a few. Since 2010 we have worked with a lady called Eila Molony, who lives in Limerick, and who, in our opinion, is a wonderful lady who has rescued probably thousands of dogs in her lifetime. Bristol DAWG have rehomed hundreds of greyhounds from her since our friendship started. If you own an Irish greyhound from Bristol DAWG there is 95% chance that you are lucky enough to have your four-legged friend because Eila has rescued him/her. (Irish dogs have tattoos in both ears). Eila works tirelessly, with just a little help from Tom at the kennels, who assists her with the dogs. We cannot begin to imagine the difficult decisions she has to make when she receives calls from the pound, from racing trainers and private individuals wanting rescue space for greyhounds. Eila is a frequent visitor to the pound in Limerick when dogs have been “dropped off”. 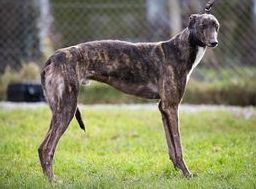 Sadly the pound only keep greyhounds for a very short time, sometimes a matter of a couple of days, if they are lucky, as in Ireland these beautiful dogs are not considered suitable as pets and are discarded if they cannot race. I personally cannot imagine, and certainly could not do what Eila does – seeing all those little faces in the pound and knowing that she only has enough money and space to take so many, as she knows what happens to the ones that get left behind – it would absolutely break my heart. Many greyhounds are sent to the pound because they have been time trialled and are just not fast enough and their life is about to end at one to two years of age, which is an absolute travesty. Anyway, getting to the point re “DAWGUST 2016”. As I have said, over the years we have rehomed hundreds of “Eila Dogs”, but over the last two years this has become more difficult. Dogs leaving Ireland must be fully vaccinated, micro-chipped, received flea and worm treatment and had a rabies vaccination. After the rabies vaccination there is a twenty-one day period before the dogs can travel and Eila has to find/pay for kennelling for three weeks before they come to the UK – I am sure you can imagine three weeks kennelling is costly for one dog, let alone the amount Eila is trying to rescue!! When these dogs reach the UK, DEFRA have to inspect that all dogs have arrived with the correct paperwork and pet passports are in order – lots of work goes on behind the scenes that no-one is ever aware of. Sometimes there are dogs that need treatment for racing injuries on top of everything else, and Eila is constantly trying to call in favours from family, friends, and her vet (where there is always an outstanding bill!!) but there is only so much goodwill. She also has to pay for transport to the UK, which is certainly not cheap. Bristol DAWG would love to do a “one off” fundraiser in August to help Eila save more dogs, so that she is not having to walk away from those little faces looking at her. We realise that we cannot save every greyhound that needs help, but a good “DAWGUST” could enable Eila to save lots of dogs. A JustGiving page will be set up for this and we REALLY hope that if you feel passionate about greyhounds, or indeed your greyhound is an “Eila Dog” you will want to help. 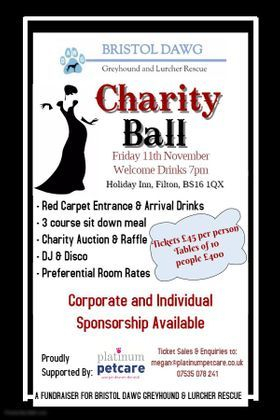 To raise money this can be an event you want to organise like a sponsored slim or swim or run or silence, quiz, skittles evening, bingo night etc. Perhaps a coffee morning, car boot sale, party, BBQ, dress down day at work – get your colleagues involved and let them know what a great cause they would be helping. We could make arrangements for you to undertake a collection at a Pets At Home store for a day/half day – just let us know. If you need posters/official sponsor forms etc. then please e-mail the charity and I will provide whatever is needed. Please donate via JustGiving (which is the easiest way to donate, plus we get Gift Aid if you are a UK tax payer – this doesn’t cost you anything, but we get an extra 25p for every £1 donated) – click on the link below here to donate, it is so easy. If you are organising an event, please keep everyone posted on Facebook so we can all get behind you. 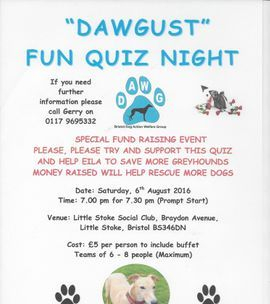 Let’s make this a greyt “DAWGUST” event and help Eila save more dogs and give them a second chance in life. June has got off to a brilliant start. Gerry spent a lovely hour this morning, with Suzanne and Dave, completing the adoption paperwork for Dessie. 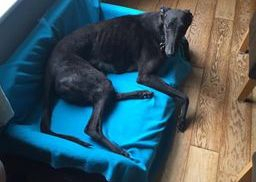 Dessie has been with Bristol DAWG for just over twelve months, but he has at long last found his perfect home with the Mundy family and their little whippet, Blue, who is a very energetic boy!! Thank you Suzanne and Dave for giving this lovely lad a second chance in life, we know you still have some work to do with socialising but you will get there - I really couldn't believe what a wonderful calm dog he has become. We must also thank Tina who very kindly fostered Dessie for a while - you did a brilliant job showing him about home life. We would like to say a massive thank you to Support Adoption for Pets for their grant of almost £3,000 to enable us to buy a wonderful industrial washing machine for use at Tonew Kennels. This will enable our greyhounds and lurchers to have lovely clean, warm duvets throughout the year. 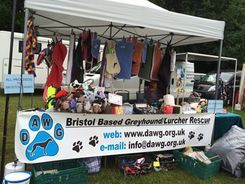 Bristol DAWG are extremely grateful for their support. FUN DOG SHOW - WHAT A BRILLIANT DAY!! Firstly we would like to say a massive “THANK YOU” to Megan and Kate who did a brilliant job judging the dog show, with so many dogs to choose from it must have been very difficult. Well done, you are very kind to support us. Best In Show was awarded to the very handsome Percy – what a stunner!! 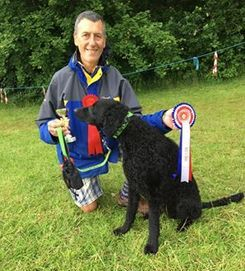 Thanks to Colin for stewarding the dog show, and Norman for helping set up and pack up. Thank you to the Mangotsfield Festival Committee, especially Simon and Madeleine, who very kindly invited us to the show again this year. Jane’s DAWG Stall (helped by Lyn) - this stall did really well selling lovely collars, coats, snoods, toys, leads, knitted greyhounds – lots of items were handmade by Jane, well done Jane brilliant job. Thanks to Amanda Jane and Lyn for their persistence selling raffle tickets for the Doggie Hamper. Platinum Pet Care – Kim and Megan, (but without Megan as she was judging the dog show!!) ran their wonderful stall. Thank you for your support, not only at this show but also throughout the year. Plus they brought their foster dog, Luna, along which has generated interest, paws crossed!! Not forgetting the four foster dogs who brought their foster parents along to display them in the ring between classes. Thank you to everyone who came along and supported our event and helped us to raise an amazing ££651 – last year was the first year we ran a dog show here and we raised £413, so a significant increase. And most of all, thank you to Gerry, who pulls the whole thing together, kicks our butts and makes sure everything runs super smoothly! REALLY HOPE I HAVEN’T MISSED ANYONE, BUT A HUGE “THANK YOU” TO EVERY SINGLE VOLUNTEER WHO HELPED DURING THE DAY. We have had news from Eila that more dogs will be on their way from Ireland next week. Four will definitely be arriving - possibly five. Freya (blue girl), Homer (black and white boy - only ten months!!) and Fred and his brother Patch who are almost identical apparently. A plea for help with fundraising - please!! Support Adoption for Pets Summer Fundraising Drive 13th July - 9th August 2016. As part of the above event we will be attending the following stores - please can anyone spare just a couple of hours on any of these dates. If you are able to help please either PM me of telephone me 0117 9695332. Pets At Home Emersons Green Store. Pets At Home Bradley Stoke Store. Pets At Home Eastgate Store. All you need to do is turn up with your four legged friend and represent Bristol DAWG - obviously, your dog must be dog/child friendly. Information/bannerstand/dog bed/chair, etc will be there. Massive thanks to Dave, Lynne and Barbara who attended Trowbridge Veterans Day yesterday, and together with a Car Boot Sale they did a couple of weeks ago, raised an amazing £279.42 for "DAWGUST". Thank you so much. Gerry spent a lovely hour this morning with Marcus, Claire, Gracie and Joe. Marcus and Claire have now officially joined that very special club called "failed fosterers" - Gerry can verify what a wonderful club it is to join, as she has done it twice herself!!. Joe has been with Marcus, Claire and their beautiful greyhound, Gracie, for a little while and he has settled well, although he is still a little shy, but is getting more confident as time goes on. Joe has certainly landed on all four paws. Thank you for giving this lovely boy his own forever home. Lovely Lady has gone to her forever home with Dee and her family in Bridgwater. She is now called Millie and we wish them all many happy years together.